You can revoke licenses from protected workloads or licensed hosts, and re-apply them to other objects that you plan to protect. License revoking can be helpful, for example, if a licensed host goes out of service or you do not want to protect some workloads anymore. In the displayed window, select a protected workload or a licensed host and click Revoke. 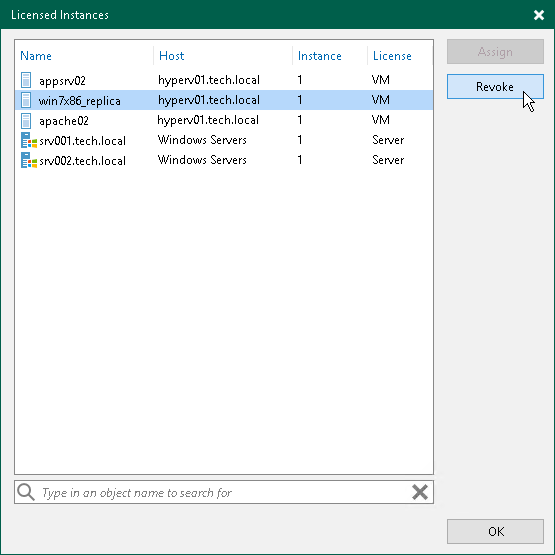 Veeam Backup & Replication will revoke the license from the selected object, and the license will be freed for other objects in the backup infrastructure.